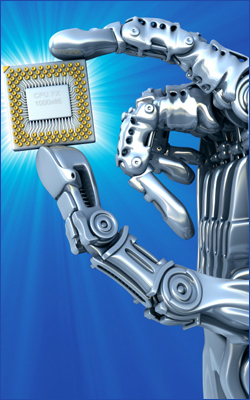 The term Edible Computer Chip® has recently gained popularity in the Nutraceutical and Pharmaceutical fields. Though Edible Computer Chips® sound like they may describe a futuristic robotic-chip that programs the human body to follow specific commands, that is not the case. Edible Computer Chip® are not synthetic, nor do they contain any non-food grade or unsafe ingredients. They are manufactured and produced from non-GMO ingredients, organic fruit and FDA acceptable food and beverage ingredients. The phrase Edible Computer Chip® was coined by research scientist, Dr. Ann de Wees Allen, as she sought to clarify and explain how the human brain responds to stimulus, such as food and beverages. Dr. Allen pointed out that a prime example of the brain-computer relationship was shown in Rainman, a very popular movie about Kim Peek, a Savant, whose brain works exactly like a computer. Rainman, played by Dustin Hoffman, closely represented the personality and abilities of the real Rainman, Kim Peek, who, like Einstein, has been a Savant since childhood. Kim Peek exhibited Savant-genius from a very early age. According to Peek's father, Fran, Kim was able to memorize things from the age of 16-20 months. He read books, memorized them, and then placed them upside down on the shelf to show that he had finished reading them, a practice he still maintains. Kim reads a page of text in about 10 seconds (about a book per hour) and remembers everything he has read, memorizing vast amounts of information in subjects ranging from history and literature, geography, and numbers, to sports, music, and dates. He can recall 12,000 books from memory, and can also perform formidable mathematical calculations in his head. Kim is also able to listen to music and distinguish which instruments play which parts, and is adept at guessing the composers of new music by comparing the music to the many thousands of music samples in his memory. Kim’s personality is quite personable and childlike, and as such, he has limitations that require him to live with a caretaker, as he is not capable of driving or performing routine tasks. Kim’s caretaker is his father, Fran, who accompanies Kim to lectures at Universities and seminars around the world. Kim continues to be in high demand and is quite pleased to any question or partake in any brain-tests that showcase his unique talent. Fran and Kim reside in Salt Lake City. Both the normal and the Savant-brain function like an organic computer, though the Savant-brain exhibits very rare memory and calculation abilities, similar to a mathematical calculator. The average human brain is not capable of processing complex calculations without benefit of a calculator or pen & paper. The Savant-brain is quite capable of conducting complex calculations in a nano-second and without forethought. The process is still not fully understood by scientists. While a computer uses electricity, or non-organic power to transmit information, the human brain utilizes organic chemicals to transmit information. Contrary to popular belief, the brain uses dietary carbohydrates as its fuel source, and not protein. In some ways, the human brain is superior to a computer. The brain is superior at interpreting the outside world and is capable of imagination and new ideas. Memories in the brain grow by stronger synaptic connections. Computer memory grows by adding computer chips. Just as a computer responds to computer chips, the human brain responds to computer chips, but the brain-computer chips are in an edible form. Every food, drink, Nutraceutical, Pharmaceutical, vitamin, and mineral ingested by humans is a computer chip. If it enters the mouth, it is an Edible Computer Chip®. A banana is an Edible Computer Chip®, and so is a hamburger, or a soda, or any other food or beverage. When a food or beverage enters the mouth, it triggers sensors on the tongue that send messages to the brain. It does not matter if you swallow the food or beverage or spit it out, the process has already begun. In the Digestion and Metabolism process, the pancreatic beta cells secrete insulin in response to circulating carbohydrate in the blood stream, resulting from the ingestion of carbohydrate-rich foods or excess protein. In the Cephalic Response process, insulin secretion begins even before any carbohydrate is absorbed into the bloodstream. During the early phase of insulin release, insulin levels start to rise in the first minute after the start of a carbohydrate-rich meal/beverage. The glucose level does not begin to rise until the third minute. The so-called “Cephalic” or early response is seen whether there is actually carbohydrate, or even any calories at all, in an ingested meal, beverage, or Nutraceutical. The brain’s neural signals, arising from visual, auditory, and olfactory stimulation, are processed before food is actually ingested. The insular cortex, orbitofrontal cortex and the piriform cortex integrate signals related to sight, taste and olfaction in humans and primates with other cortical modalities such as memory of past experiences (place, safe vs. toxic food, etc) to influence food intake. Many of these external sensory cues contribute to the Cephalic phase response to food, which consists of increased salivation and gastrointestinal hormone secretion, among other responses. The mere anticipation of a pleasurable meal is enough, in some situations, to stimulate an insulin response. The Cephalic phase response actually prepares the body for optimal absorption and utilization of nutrients. The sensation of sweet taste is one of the most potent triggers of the Cephalic response. The Cephalic response of artificial sweeteners is known to stimulate insulin release and cationic fluxes in pancreatic islets. Sucrose (table sugar), Saccharin, Cyclamate, Stevia (sevioside), Acesulfame-K (Ace-k), Aspartame, and many other sweeteners, cause an increase in insulin release from pancreatic islets incubated in vitro in the presence of 7.0 mM D-glucose. The insulinotropic action of artificial sweeteners may be mediated through G-protein coupled receptors similar to those involved in the activation of taste buds by bitter compounds. The pancreatic hormones insulin and glucagons function primarily to regulate glucose homeostasis. A secondary role is that of signaling energy intake to the central nervous system, as the beta cells in the pancreas release these hormones in response to feeding. Because basal insulin levels rise in relation to adiposity, circulating insulin levels also serve as a measure of energy stores. While elevated insulin levels in the brain may cause a decrease in food intake, the action of insulin peripherally is to lower circulating blood glucose levels and serve as a stimulus for food consumption. excess energy in the form of fat. Thus, the Cephalic response of insulin secretion serves to exacerbate weight gain, obesity, Insulin Resistance, and diabetes by elevating insulin levels, increasing appetite and by enhancing fat-storage. This also applies to functional and beverages, as well as diet sodas and colas that contain -0- calories, carbohydrates, or proteins. Studies performed at the Glycemic Research Institute® under the direction of Dr. Ann de Wees Allen showed that artificial sweeteners packaged with dextrose and maltodextrin elicit a positive insulin and blood glucose response from the carriers, even if the artificial sweetener itself did not elicit a response (Allen, 2006). Conversely, Sweet Infused Fruits™ do not elicit Cephalic response or Cephalic phase insulin release. Sweet Infused Fruits™ (SIF) are 100% natural fruit sweeteners (SweetInfusedFruits.com) typically used in Edible Computer Chips®. Current examples of Edible Computer Chips® in action range from treatments for genetic polymorphisms, including Sickle Cell and Thalassemia (EncodeResearch.com) to fat-burning drinks, L-Arginine formulas, Nitric Oxide (NO) formulas, anti-aging formulas, chocolate, candy, ice cream, and Kid Friendly products. Five years of Human In Vivo Clinical trials have been conducted on the development and quantification of Low Glycemic, Non-Cephalic chocolate. The Edible Computer Chip® chocolate, chocolate candy, and ice cream are 100% natural and safe for children. Further, the Edible Computer Chip® chocolate, chocolate candy, and ice cream meet all the guidelines for “Safe Products for Children” per the Glycemic Research Institute® Kid Friendly Certification Mark clinical protocols, which are the strictest in the entire food and beverage industry. Burger King® Apple Fries have also met the guidelines for the Glycemic Research Institute® Kid Friendly Certification Mark. Burger King® is the first fast-food company to receive the coveted award for “Kid Friendly Product of the Year". The Pharmaceutical, Nutraceutical, and food industries have embraced the newest and most promising area of medicine. Nanomedicine is the science of Nanotechnology, which encompasses futuristic-technology. Using Nanotechnology, researchers will be able to map the networks and processes inside living cells. Understanding how these networks change over time and during disease processes will enable researchers to detect and correct a wide range of biological defects in unhealthy cells. The goal is to provide the scientific foundation for new strategies to diagnose, treat, and prevent disease. The term Nanotechnology is used to describe the interdisciplinary fields of science devoted to the study of nanoscale phenomena employed in nanotechnology. Spherical nanoparticles are three dimensions on the nanoscale, i.e., the particle is between 0.1 and 100 nm in each spatial dimension. This tiny world of chemistry has spun into an entire industry of research in which nanoparticles participate in all facets of medicine, including preventive medicine. The Nanotechnology revolution began in January 2000, when U.S. President Bill Clinton requested a $227-million increase in the government's investment in Nanotechnology research and development. This included a major initiative called the National Nanotechnology Initiative (NNI) that nearly doubled America's 2000 budget investment in Nanotechnology, bringing the total invested in Nanotechnology to $497-million for the 2001 national budget. In a written statement, White House officials said that "nanotechnology is the new frontier and its potential impact is compelling." 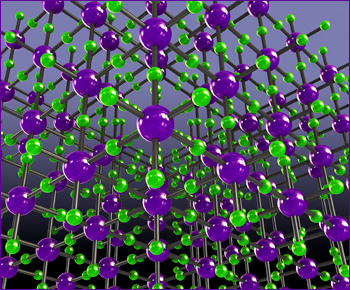 The National Nanotechnology Initiative (NNI) is a Federal government Research & Development program established to coordinate the multiagency efforts in Nanoscale science, engineering, and technology (www.nano.gov). As of 2006, large industry supports about half of the R & D in nanotechnology in the U.S., about $2 billion per year. The other half comes from small business and investors, as well as Federal, state and local governments. Twenty-five Federal government agencies participate in the NNI, 13 of which have an R & D budget for Nanotechnology. The NNI is managed within the framework of the National Science and Technology Council (NSTC), the Cabinet-level council by which the President coordinates science, space, and technology policies across the Federal Government. The Nanoscale Science Engineering and Technology (NSET) Subcommittee of the NSTC coordinates planning, budgeting, program implementation and review to ensure a balanced and comprehensive initiative. In addition to funding research, Federal support through the NNI provides funds for the creation of university and government Nanoscale R&D laboratories. The President’s 2007 Budget provides over $1.2 billion for the multi-agency National Nanotechnology Initiative (NNI), bringing the total investment since the NNI was established in 2001 to over $6.5 billion and nearly tripling the annual investment of the first year of the Initiative. The 2007 request by HHS includes programs at NIH emphasizing nanotechnology-based biomedical advances occurring at the intersection of biology and the physical sciences and at the National Institute of Occupational Safety and Health (NIOSH) that address implications and applications of nanotechnology for health and safety in the workplace. The 2006 estimate and 2007 request include, for the first time, contributions from the DOE Office of Fossil Energy and the USDA Forest Service. The National Institutes of Health (NIH) recently announced its Nanomedicine Development Centers Awards that will share approximately $42-million over five years. The four advanced centers in nanomedicine are part of the NIH's New Pathways to Discovery (www.Nano.gov). The four centers are: The Center for Protein Folding Machinery at Baylor College of Medicine; The National Center for Design of Biomimetic Nanoconductors at the University of Illinois, Urbana-Champaign; Engineering Cellular Control: Synthetic Signaling and Motility Systems at the University of California, San Francisco; and the NanoMedicine Center for Mechanical Biology at Columbia University in New York (1). Nanomedicine Development Centers will be established across the country and will be staffed by multidisciplinary scientific teams, including biologists, physicians, chemists, physicists, mathematicians, engineers, and computer scientists. These teams will conduct research and will train the next generation of students in this new research area of medical science (1). The new $84-million Molecular Foundry on the Lawrence Berkeley National Laboratory (LBNL) campus in Berkeley, California will allow scientists to begin making new types of Nano-scale material. About 70 percent of the new nanotechnology funding will go to university research efforts, which will help meet the demand for workers with nanoscale science and engineering skills. The initiative will also fund the projects of several governmental agencies, including the National Science Foundation, the Department of Defense, the Department of Energy, the National Institutes of Health, NASA and the National Institute of Standards and Technology. Much of the research will take more than 20 years to complete, but the process itself could touch off a new industrial revolution. The nanomedicine institute will focus on developing nanostructures for biomedical research. UMASS is no stranger to nanotechnology—its Lowell campus is home to a Nanomanufacturing Center of Excellence. The nanomedicine institute was created with two funds: the UMass President Jack M. Wilson's Science and Technology Initiatives Fund, and the President's Creative Economy Fund. The institute’s team includes researchers from UMASS Amherst (home of the institute), the UMASS Medical School, and UMASS Lowell. According to the institute, they will initially concentrate on three research areas: engineering fluorescent nanostructures that can be used for tagging proteins to aid in understanding the immune system; engineering of magnetic nanoparticles to remove pathogens such as viruses from blood; and developing biodegradable nanostructures that can help train the immune system to recognize and respond to the malaria parasite. In Taiwan, the government has launched the National Science and Technological Program for Nanoscience and Nanotechnology, with the focus on catapulting Taiwan’s Nanotechnology industry to more than US $9 billion by 2008. • More than 400 Taiwan companies are now engaged in the Nano business, with 70 universities developing Nanoscience for industrial applications. • Nanotechnology was featured at Nano Tech Taiwan 2006, an International symposium on new global technologies. • In 2004, there were more than 300 Nanotech patent applications filed in Taiwan. The Japanese government has decided to invest heavily in nanotechnology and bio-nanotechnology research, which is regarded as a key initiative to boost the national economy. The European Union expects its overall public investment in Nanotechnology research to triple by 2010.